These Preparation Directories are just meant to be guides for your quest. Apart from all its technology, systems and gee-whiz gadgetry the Web is still something we R.. E.. A.. D..
You have approximately 10 seconds from the point a person lands on your site to retain their interest. Poor copy (words) means a poor retention rate. Good copy means a good retention rate. So, how do your WORDS rate? Although it's always the better course to have your own product on the web, you can generate income in numerous ways. 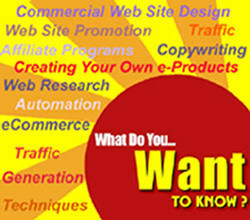 This is where you'll go when you want to know how to find a product/service to sell. Okay, so you've decided you're going to take the high road by creating your own product or service to sell. Perhaps you even have one already? This is where you'll go when you have a GREAT idea for a product or service to sell online, which (of course) you've already researched !! There are many, many options. The approach you take all depends on your researched idea and what you wish to achieve. When you don't know the difference between an intangible goods Ecommerce provider and a tangible goods Ecommerce Provider this is where you'll go. Just like in the real world of business and finance there are many different online financial institutions. They each provide different services. Which one is right for you and your web-venture? Armed with some fundamentals on these services it'll be much, much easier to find the right e-commerce providor for you, your product and/or service. It may not be as FAST... but it's always MUCH CHEAPER to expend your *grey matter* before you spend your hard earned cash. 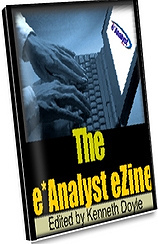 -------->> T E S T I M O N I A L <<-------- Ken, your ezine is one of the few I take time to read. It's filled with real, practical advice on web marketing - from a guy who knows what he's talking about!"